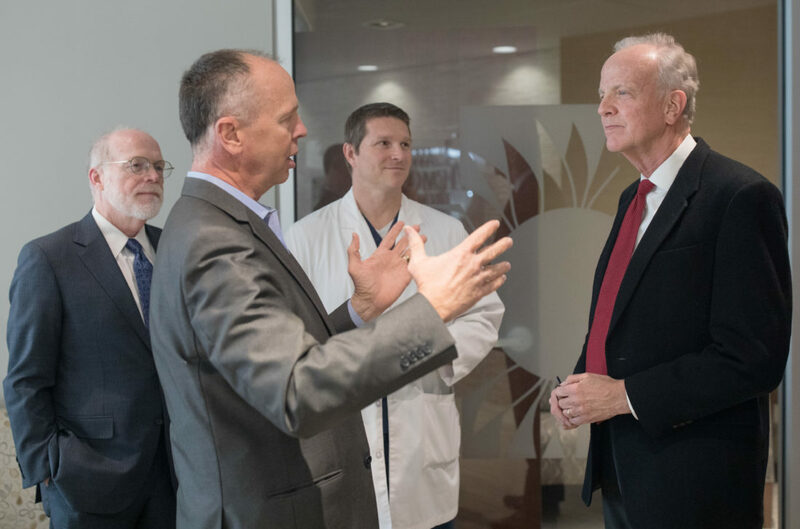 U.S. Sen. Jerry Moran, R-Kan., right, visits Lawrence Memorial Hospital on Wednesday, Jan. 2, 2019. Meeting with Moran, from left, are Tom Bell, president and CEO of the Kansas Hospital Association; LMH President and CEO Russ Johnson; and LMH hospitalist Marc Scarbrough. Republican U.S. Sen. Jerry Moran wants to leave the decision of Medicaid expansion in Kansas to the Legislature, but health care professionals have suggested to him that it could be the best way to help hospitals and address mental health issues, he said during a visit to Lawrence on Wednesday. After meeting with LMH Health president and CEO Russ Johnson, Moran told the Journal-World he was happy to learn about how the Lawrence hospital is interested in working with other health care providers in Douglas County to offer more services for physical, mental and behavioral health. When asked if he had any guidance for the Kansas Legislature on expanding Medicaid, which would offer more funding reimbursements to hospitals in Kansas, Moran noted many rural hospitals are “hanging on by a thread” and could benefit from the additional revenue. 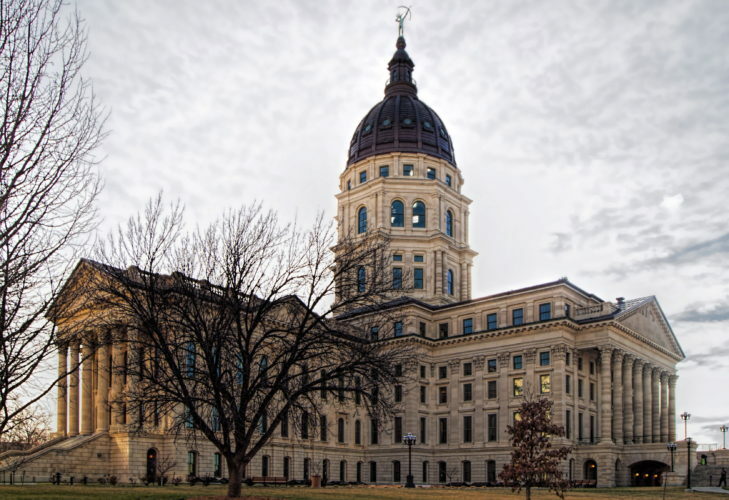 Medicaid provides health coverage for lower-income and disabled Americans, including 377,000 in Kansas, and is funded jointly by states and the federal government. Most states have expanded the program, accepting additional funding from the federal government provided through the Affordable Care Act. The federal government paid the full cost of the expansion until 2017 and will continue paying 90 percent starting in 2020. In Kansas, former Republican Gov. Sam Brownback and outgoing Gov. Jeff Colyer were the biggest reasons for the state not expanding the program. Both cited the cost as the main factor. 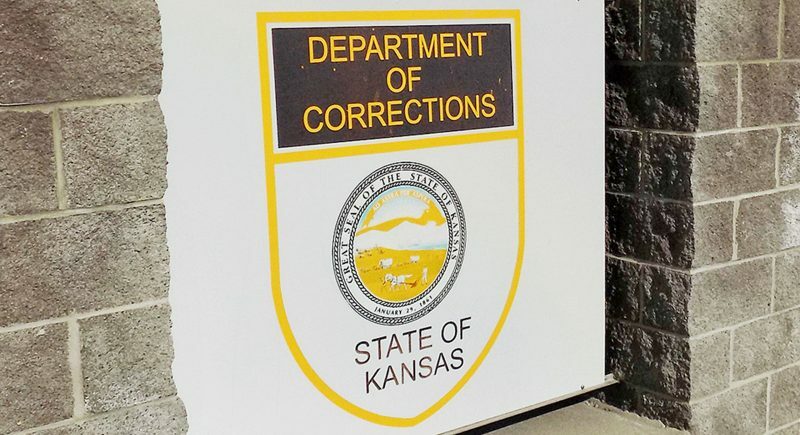 Colyer’s budget office estimated the expansion would be a net cost of $22 million for the fiscal year beginning in July 2019. But incoming Gov. 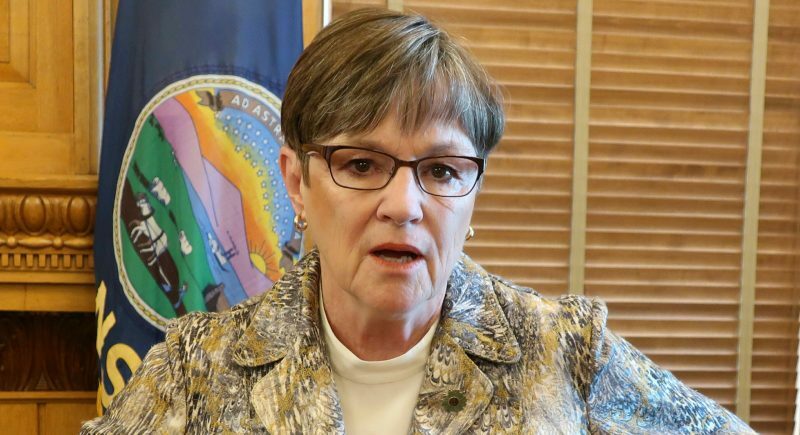 Laura Kelly, a Democrat, said she plans to establish a working group to explore a bipartisan plan for Medicaid expansion. Although Moran was visiting Kansas on Wednesday, he said he will soon head back to Washington. A new Congress will be sworn in on Thursday in the middle of a government shutdown, which has lasted for almost two weeks and has furloughed many federal workers. Congress and President Trump remain at an impasse, with the issue of funding for Trump’s proposed border wall being the main point of contention. Moran said he plans to be back in session on Monday, but he will be ready to head back earlier if it can help end the shutdown sooner. Moran believes the issue could be resolved in a typical legislative negotiation, such as providing some of the border wall’s funding now and more later, if the people involved would “come out of their corners,” he said. “I would be supportive of additional dollars for border security, but it ought to be something that we can reach an agreement (on a plan) that the experts tell us is best to spend the money,” he said. Moran is also concerned about the impact of immigration policy on higher education. He said he has heard that many institutions of higher education in Kansas, particularly community colleges, are losing foreign student enrollment. Immigration issues need to be resolved to attract those students again, he said, noting that foreign students are often important to generating revenue for higher education institutions and that they also help increase economic activity in the communities they study in. 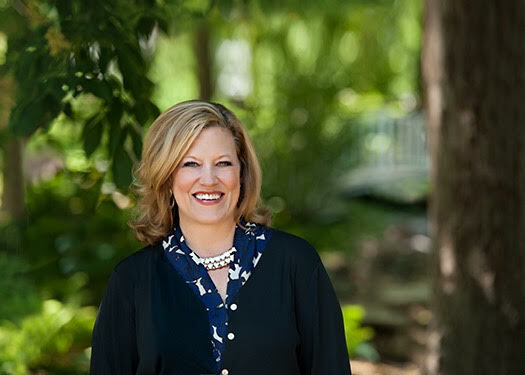 Kelly recently told the Journal-World she wants to work with the state’s federal delegation to pass immigration reform, which could help the University of Kansas’ budget issues. Moran said he has worked with leaders in the U.S. Department of Homeland Security and the U.S. Department of Education to make sure visas are still available to foreign students, and he said he would gladly work with Kelly to address the issue. “We would welcome the opportunity to work with anyone on this topic,” he said. Another issue affecting Kansas is the trade war with China, which put U.S. soybean purchases on hold until the two countries agreed to a truce in December. Moran said he has heard concerns from Kansas farmers about the trade war caused by tariffs on Chinese goods. He said he believes the U.S. needs to punish the country for allegedly stealing intellectual property from American businesses and conducting cyberattacks on U.S. agencies, among other issues, but tariffs are not the best way to do it.